Gardening outdoors is much preferable to me so I keep very few plants inside. 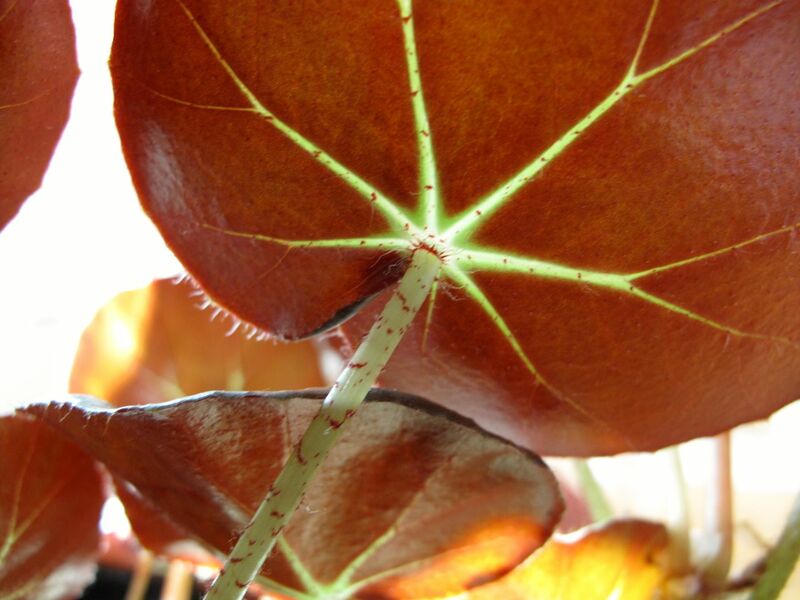 One exception is Begonia ‘Erythrophylla’ (Beefsteak Begonia), a plant I adore for its glossy leaves with reddish undersides. 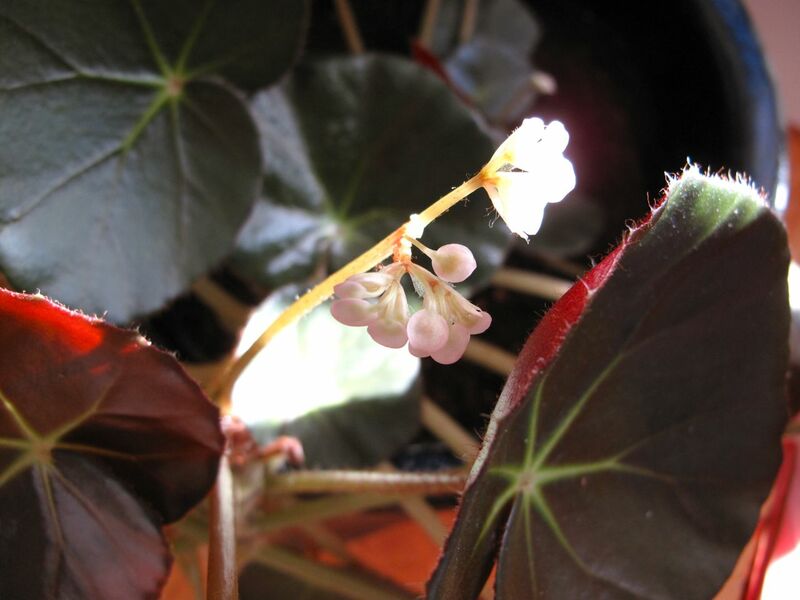 Two years ago when I admired a fellow garden club member’s Beefsteak Begonia, she quickly offered me a cutting to take home. It soon rooted and last year bloomed in October. 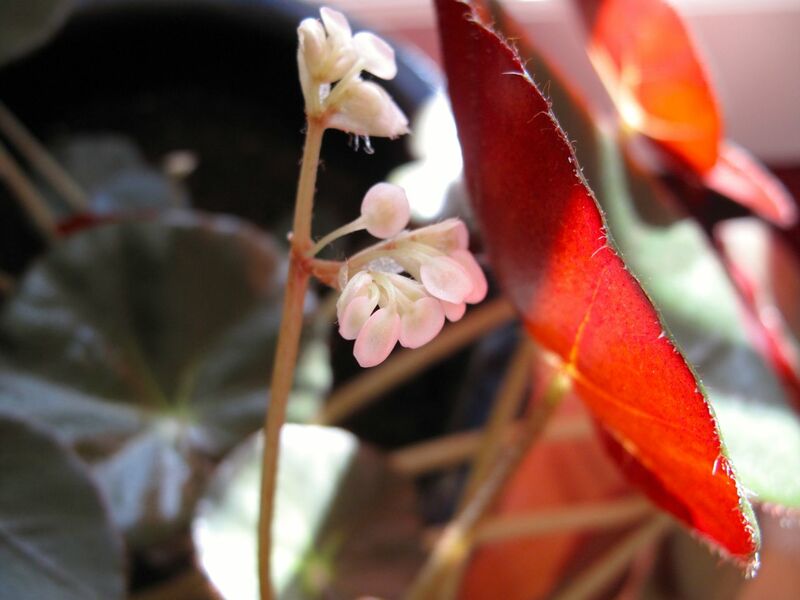 This year it waited until Christmas week to start sending up its first flowers—white with a bare tinge of soft pink. 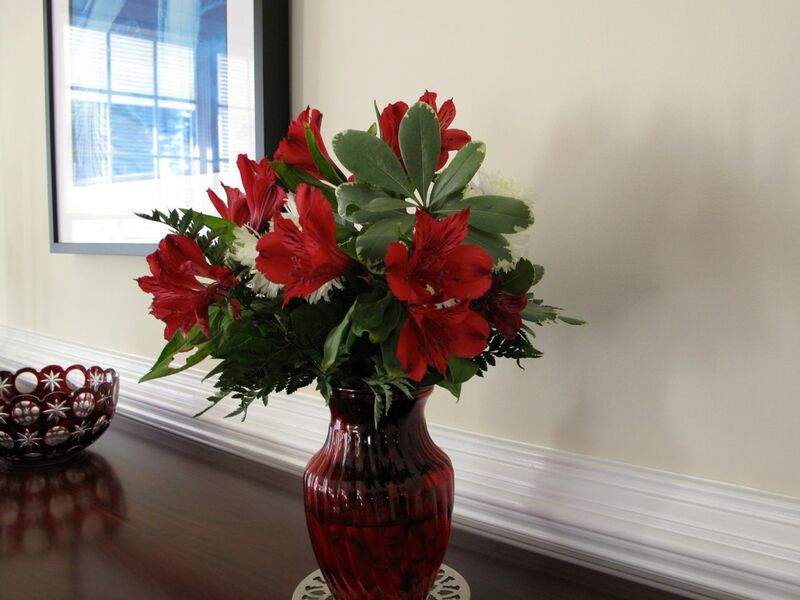 A cherished bouquet from dear friends arrived during the holidays, formed of a crimson vase of red Alstroemeria paired with white Chrysanthemums. The arrangement brightened the house and the hearts within. Our daughter is an industrial designer turned architect with a keen aesthetic sense. For Mother’s Day one year she presented me with a unique walnut centerpiece for the table that I adore. The walnut board she used was one she had rescued from a scrap pile, discarded because it had a serious crack running through the center. This very flaw she turned into a feature by slightly enlarging the crack and carving portions of the inner and outer edges for textural interest. 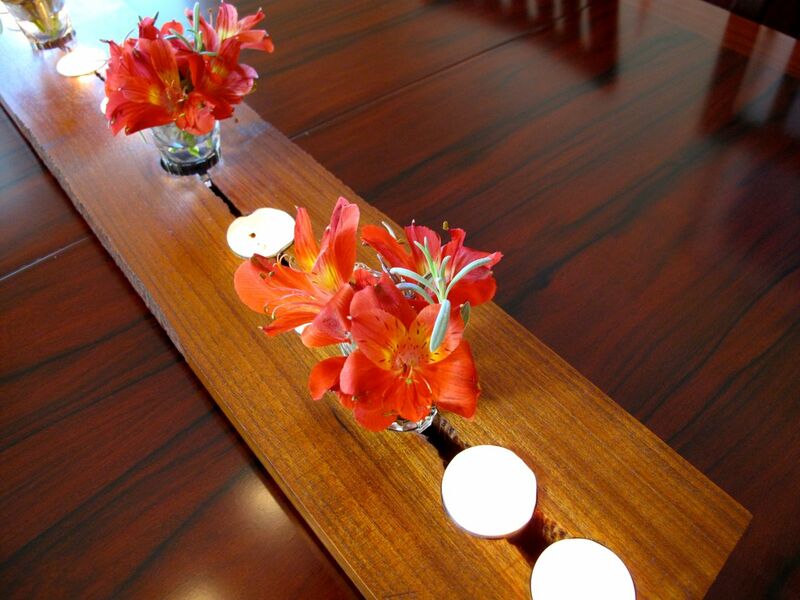 The centerpiece flares out slightly at either end. 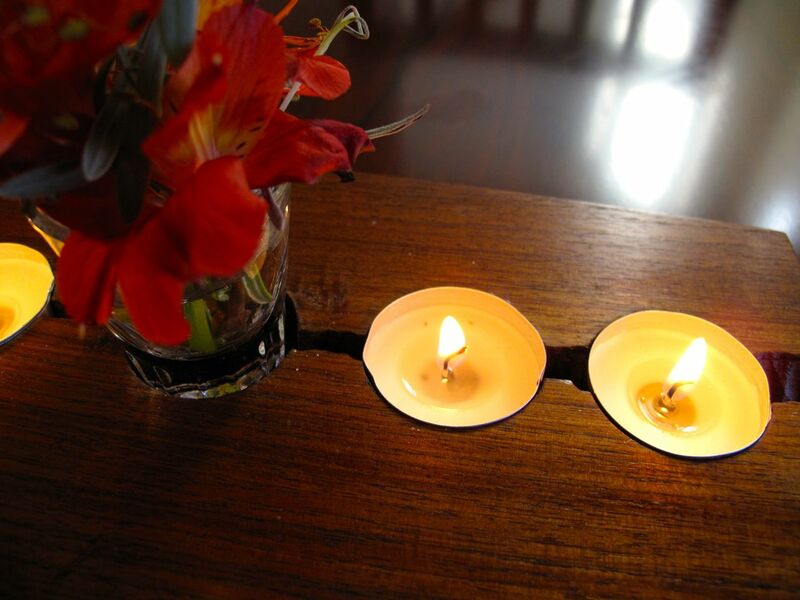 She creatively spaced holes that are suitable for tea candles. Conveniently, shot glasses fit also and can be used to hold blossoms. 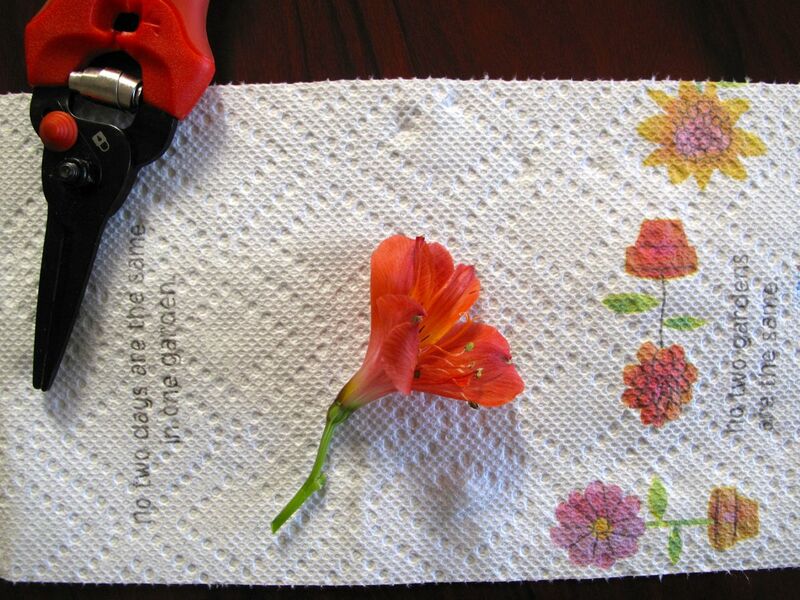 I use this art piece year-round to hold candles and special flowers that usually come from my garden. Sweet William, echinacea, gardenias, camellia blossoms, yarrow, roses, spirea and daffodils all make lovely, informal miniature arrangements, especially when complemented by sprigs of lavender, artemisia or other greenery. 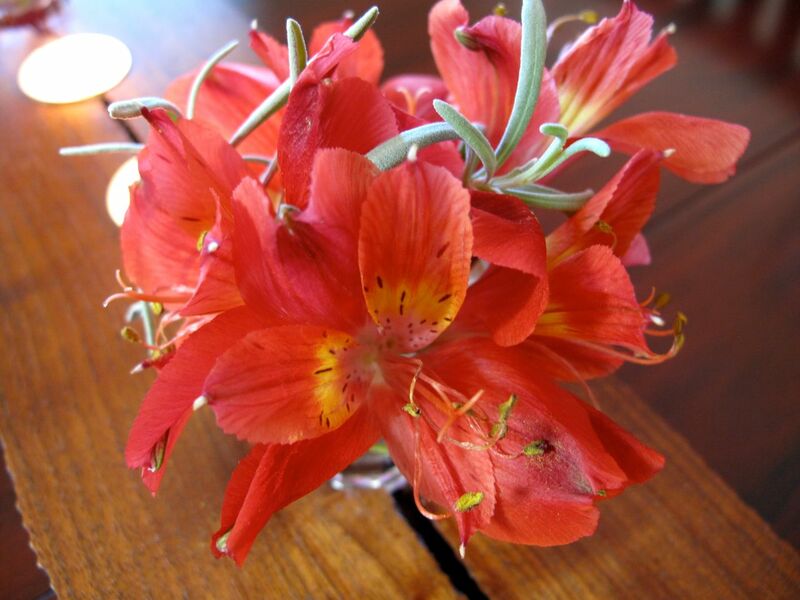 During the holidays the garden had very few blooms that were not damaged by various cold snaps, so I purchased Alstroemeria to use with silver leaves of lavender for a simple combination. Out of habit I usually buy unpatterned paper towels without dyes, but somehow before the holidays I ended up with a package featuring a design edged in flowers. Upon opening I found these towels speak to me! This sheet bears the reminders No two days are the same in one garden and No two gardens are the same. Who knew paper towels came with a smile? 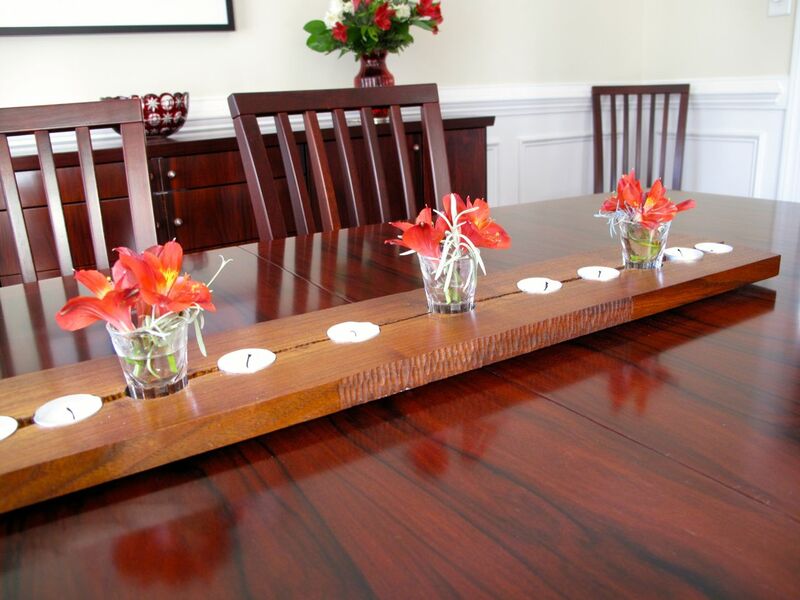 This entry was posted in garden and tagged Begonia 'Erythrophylla' (Beefsteak Begonia), Floral Design, garden quote, table arrangement on January 3, 2014 by pbmgarden.